Get ready to lose yourself in videogames—literally. 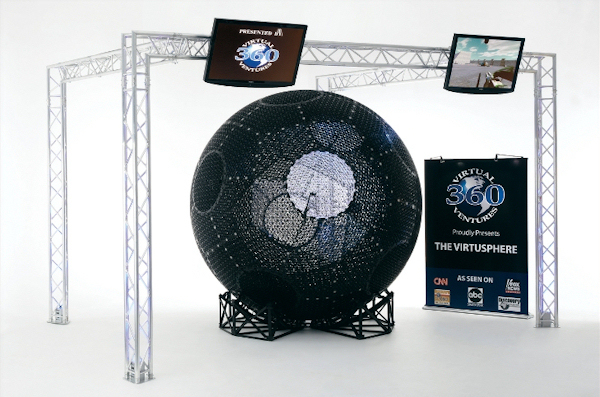 In May, the Excalibur Hotel and Casino in Las Vegas installed the first public Virtusphere, a human-sized hamster ball that lets you move through virtual worlds by walking, running, or crawling inside it. Until now, the sphere has been used primarily for military and police training. Now, wearing a virtual-reality visor, anyone inside can play a first-person-shooter game or tour historic Russian architecture. The 10-foot sphere is made of the same plastic as Legos, and its curvature helps to cushion players if they fall. The ball spins on a platform fitted with 45 caster-mounted wheels. Beneath, an optical sensor tracks motion the same way a computer mouse does, watching for relative movement across x and y axes. To make the experience truly immersive, the player is fitted with a head-mounted display with two internal LCD screens. A laptop wirelessly collects the data from the sensor and the gyroscopes, magnetometers and accelerometers on the headset to create the image the player sees. As new spheres pop up in malls and arcades, users will be able to jump into movie trailers or globe-trot using Google Earth. Visit 360virtualventures.com for more information.